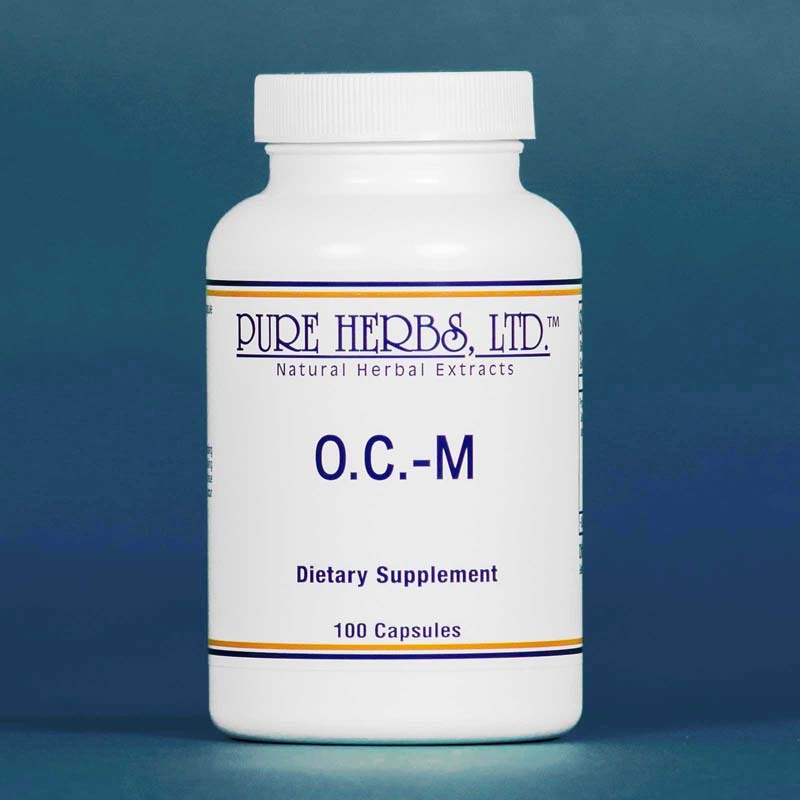 O.C.-M (CAPSULES) Approx. 650 mg(10 GRAINS) 100 Capsules (ORAL CHELATION = taken by mouth + to claw out) - The importance of keeping arteries and veins free of fats, cholesterol and hardened waste mineral accumulation, can be the difference between a normal life and a substandard existence with reduced activity, life expectancy and or memory problems. Oral chelation is the action of taking herbal cleaners and conditioners, by mouth, to prevent and clean out circulatory congestion. Please note, there is no fear of congested bits of debris breaking loose, lodging and causing a problem elsewhere. Herbs are intimately well-programmed by the Creator to do their job with only intended effects and without dangerous side effects. They can be used with confidence. Chickweed dissolves fat and promotes flexibility.Flax dissolves cholesterol and a type of fat known as triglycerides (glycerol and stearic, oleic and palmitic fatty acids). Stone Root dissolves stone accumulation anywhere in the body, including heart valves, kidneys and bladder, as well as the circulatory system. The leaves of the two herbs, Ginkgo and Gotu Kola, (there is no caffeine in Gotu Kola; this is a miniature water lily, not the kola nut) nourish the brain and nervous system and keep energy flowing to them. In the process, they also build a strong memory and in the case of a stroke, reverse the damage*. If it is known specifically where the blood vessels are congested, such as the neck or the heart, then an external application can be undertaken to speed the process of cleaning and normalization. Apply Vitamin E from 100 to 400 i.u. capsules (International Unit, i.u., is an international measurement of liquid vitamins) to the area to prevent irritation, then Herbal Adj. to increase circulation (avoid contact with eyes, underarms and private areas as this can produce a temporary but unpleasant burning sensation, although no permanent damage is done), then apply Oil of Cajeput (with the same precaution as Herbal Adj.) to the skin to break up mucus congestion. Finally, saturate a single layer of cheesecloth or absorbent gauze with O.C.- M. Lay this over the area to be chelated. Cover with plastic sandwich wrap and finally, wrap a cloth around the area to keep all in place overnight. The next morning, discard the application, wash the area and allow it to dry, then put on a daytime application just as was done for the night. Continue this procedure for the night and day until chelation is completed and all structures are normal. Keeping a good working circulatory system and correcting a congested circulatory system makes good sense and improves the quality of life. * COMBINATION: Ginkgo, Gotu Kola,Chickweed, Flax, Stone Root. CAPSULE DIRECTIONS: CAPSULE DIRECTIONS: As an herbal supplement, take one capsule daily or as directed by your healthcare practitioner. Note: One capsule equals about 20 drops of the liquid. SUPPLEMENT FACTS Serving Size: 1 Capsule Servings per container: 100 Proprietary Blend: 700 mg.Ginkgo (Ginkgo biloba), Gotu Kola (Centella asiatica). Chickweed (Stellaria media), Flax (Linum usitatissimum),Stone Root (Collinsonia canadensis) *Daily Value not established OTHER INGREDIENTS: Gelatin Contains No Sugar, Salt, Starch,Yeast, Wheat, Gluten, Corn, Milk, Egg,Shellfish or Preservatives. This product has not been evaluated by the US Food and Drug Administration.This product is not intended to diagnose, treat, cure or prevent any disease.